This is a backup accessories kit for your GoPro Hero 6 /GoPro Hero 5. We only use the excellent material to produce the six Gopro Accessoriesfor you. Screen≤ns protection film: two tempered glass screen protector for each. 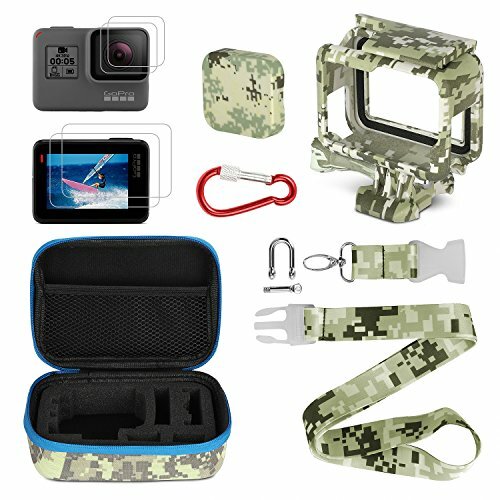 【All camouflage gopro accessories kits 6 in1】: We only select the most 6 useful Gopro accessories kits for you. Unlike other action camera accessory kitwith so many not practical items. We select the storage bag, lens cap cover,protective case, carabiner, strap, screen≤ns protection film with cool camouflage theme for you. 【Portable storage for you to take along your GoPro Hero 5/Hero 6Hero (2018 easily】: Portable Small Carrying Case for GoPro hasshockproof high density foam inside with light EVA outside. Portable storagehas a small size of 6.2*4.3*2.5 inch for you to take along easily. 【Carabiner and camouflage strap for you to hang on your neck when outside】: 23.6 inch camouflage strap is long enough for you when outdoors. Its camouflage color is so cool and its material is nylon , which is durable enough. Besides, its buckles are all through 24 hours salt spray test that are easy for you to connect the GoPro. 【Double set Screen&Lens protection film】For Screen&Lens, ourGopro Accessories Kits provides two tempered glass screen protector for each, which is enough for you to use. The screen&Lens protection film will prevent your valuable from being hurt and you can use your GoPro without worry. If you have any questions about this product by Kitspeed, contact us by completing and submitting the form below. If you are looking for a specif part number, please include it with your message.